Small in size, big in flavor. This mini peanut butter cheesecake is like a little slice of heaven. I’ve been told I’m good at being bossy……….so bear with me, but you MUST make these Peanut Butter Cheesecake Minis. Like NOW! Throw a coat on (it suddenly got really cold here! ), put your hair up in a ponytail, swipe some lip stick on, grab your sunglasses and run to the store for the ingredients! Running will make you feel less guilty when you eat peanut butter cheesecake for breakfast tomorrow. 😉 Yes, they taste as good as they look—hard to go wrong with a peanut butter and cheesecake covered in chocolate. 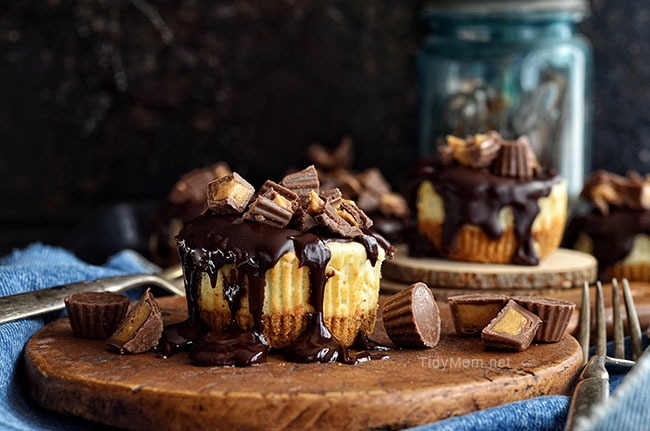 The only thing better than peanut butter cheesecake, is mini peanut butter cheesecake with peanut butter cups! These little gems are rich, luscious and oh so decadent. 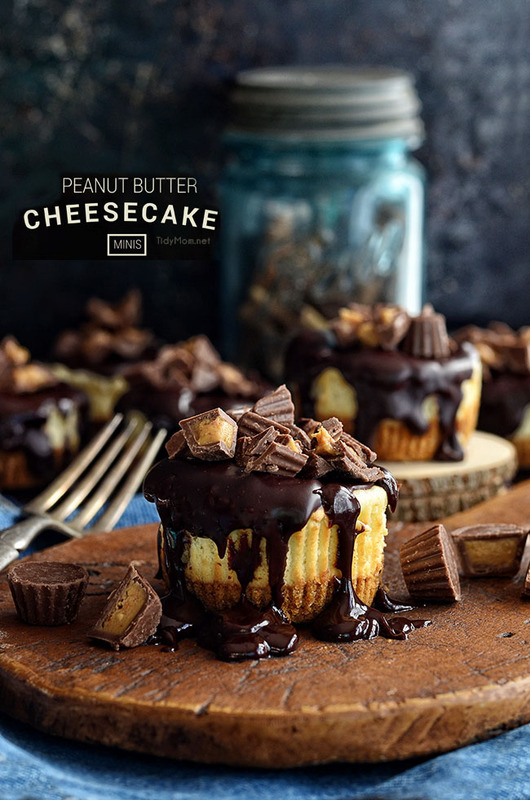 One peanut butter cheesecake mini is plenty for one serving, but they will definitely tempt your taste buds towards having seconds. They are really easy to make, so you’ll have no excuse not to make these peanut butter cheesecake minis. For another variation, you could always skip the ganache and finish with some whipped cream and chocolate shavings. Either way, they are impressive and can be made ahead of time. 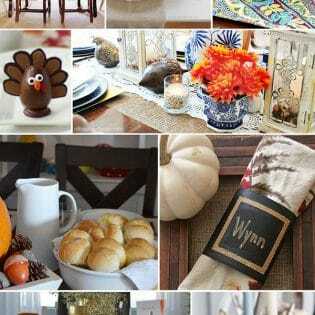 Perfect for holiday entertaining. To make crust, in a bowl, combine graham cracker crumbs, sugar and melted butter until crumbs are moistened. Press crust into bottom of each muffin cup (I used the bottom of a glass to press crust). Put 1 peanut butter cup into the center of each crust. Beat cream cheese and peanut butter with an electric mixer until fluffy. Add sugar, flour, and vanilla, beating well. Add eggs, 1 at a time, beating well after each addition. Spoon cream cheese mixture over peanut butter cups and graham cracker crusts. Bake until just set and no longer jiggle when you move the pan, about 20 minutes. Turn the oven off and open oven door a crack, and let the cheesecakes cool off for 15 minutes. 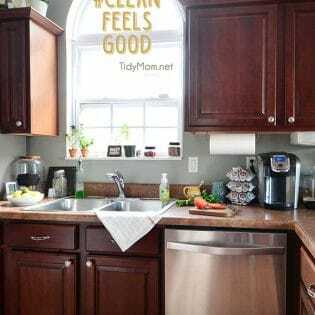 Remove from oven and let sit to cool completely and chill in refrigerator for at least one hour. While cheesecakes are cooling, make ganache. Pour ganche over cold cheesecakes, and top with chopped peanut butter cups. Refrigerate at least another 2 hours before serving. These mini cheesecake are gorgeous and I am totally craving them right now. I have to make them! PS: LOVE the photos! Great mini cheesecakes, they look heavenly delicious! These look amazing! Quick question- how far did you fill each cupcake liner? Did the cheesecake rise at all once placed in the liner? 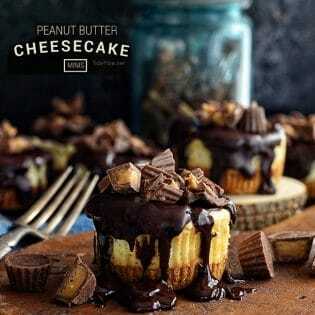 I am a peanut butter fanatic so I can imagine how good these mini cheesecakes must have tasted. Wish I had one to devour now! Um…HI. You should bring these when we have our coffee date. These look AMAZING. I’m dying!!! Beautiful photos and wow do they look delicious! These photos are fantastic! 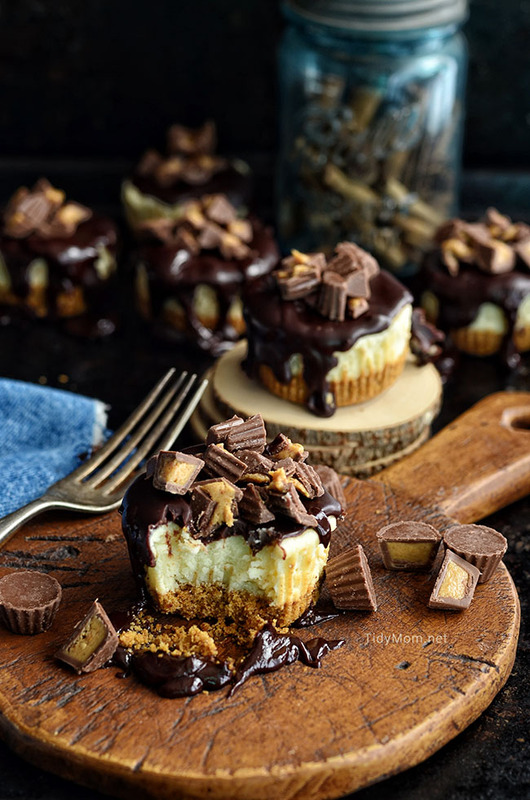 I’m a huge fan of the peanut butter and chocolate combination, so I would love to dig in one of these lovely cheesecakes! These look amazing!! My mom loves cheesecake and peanut butter cups, so this is a must-make when I am home for Christmas this winter! Pinned! So so gorgeous!! I can seriously have just these for my dinner! YUM! OMG, these look soooo awesome. Tiny bites are the best. You get to pop a few and a few plus a few more, and not feel TOO bad about it 🙂 🙂 🙂 You did such a good job with these! I agree…it is hard to go wrong when you combine peanut butter and cheesecake. This looks delish! with cheesecakes like these, you can boss me around all you want! These look AMAZING!!!! I am planning to make them this weekend. I was just wondering if you have tried this with an oreo crust? I was thinking about trying it out, but wondered if you or someone else had? no, but after we made them I thought the same thing! I’m sure they would be fantastic with an oreo crust! !